While his parents beamed, Noah was nearly speechless, and clearly overwhelmed as an entourage from the University of Maryland hand delivered that coveted big envelope that college hopefuls dream about. WASHINGTON — Shortly after 9:30 a.m. on a blustery Sunday morning, a bus from College Park pulled up to Noah Jones’ house in Bowie. 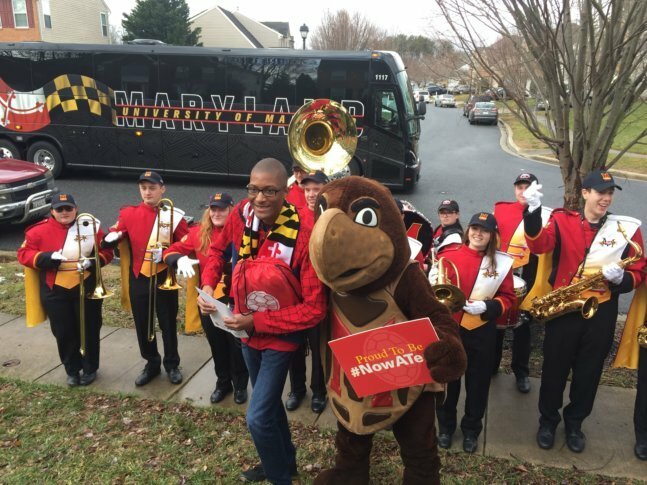 When the doors opened, out came members of the marching band, Testudo the mascot, and Shannon Gundy, the director of admissions at the university who was carrying the big envelope high school seniors are always hoping for. While his parents beamed, Noah was nearly speechless, and clearly overwhelmed. He was also probably pretty tired, since his parents cut short a ski trip to help make this event happen in his front yard. This was the first of a handful of stops the admissions office was making around the state of Maryland today to let graduating seniors know they’ve been accepted at Maryland. This is the third time the school has done acceptance events. How was Noah picked? Noah’s mom and aunt are both College Park grads as well, and he said he’s wanted to go there ever since he participated in a young scholars program in 2016. He plans to major in history.